Here at MetaEfficient, we’re always looking for an excuse to ride a bike, rather than drive a car. It’s just more fun, and you get the added benefit of exercise. But what if you want to take your bike to work or to get groceries? Most bikes in the U.S. are built for recreation in mind, not as vehicles that can replace cars on short trips. Basically, bikes are missing two things: storage space, and an electric motor help you go swiftly across town. That’s where the Stokemonkey comes in. 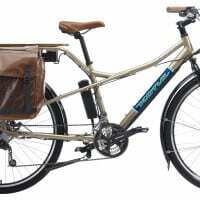 It’s an electric motor kit that works in tandem with an Xtracycle. (Don’t know what an Xtracylce is? (See this previous post). Xtracycle gives almost any bike great cargo capacity, and Stokemonkey gives you the power to haul it over mountains or swiftly across town. It works like this: when you want help, you turn a variable-speed throttle on the handlebars to engage the motor. The motor drives the pedals, just like the stoker of a tandem bicycle helps the captain. You cannot use the motor without pedaling along, but you can pedal normally without any added resistance, and coast whenever you let go of the throttle. Top speed can exceed 30 MPH on level ground, and 20 MPH up modest hills. Powered range is limited only by the amount of battery packs you carry, but to leave ample room for cargo and remain light enough for pleasant unassisted pedaling, Stokemonkey is generally most useful for trips up to 50 miles between recharges. Complete Stokemonkey kits start at $1350. Top speed can exceed 30 MPH on level ground? does that not make it an illegal motor cycle? Realistic no, if your speed is around 25 MPG, it’s considered a bicycle. will stoke monkey adapt to my tandem bike? Nice post. For interest, here’s another way of doing it.